The request will be heard in Hamburg. On 16 April, Ukraine filed a request with the International Tribunal for the Law of the Sea (ITLOS) seeking provisional relief against the Russian Federation. The request seeks the release of the three Ukrainian naval vessels and the 24 servicemen unlawfully seized by the Russian Federation in the Black Sea on 25 November 2018, the Ukrainian Foreign Ministry has said on its website. It recalled that under the United Nations Convention on the Law of the Sea (UNCLOS), naval vessels and the personnel on board have complete immunity, meaning that foreign nations may not seize them, detain them, or subject them to legal proceedings. Russia’s seizure of Ukraine’s vessels in the Black Sea, continued detention of the vessels and the servicemen on board, and attempted criminal prosecution of those servicemen blatantly violates UNCLOS. On 1 April 2019, following months of efforts to secure the release of its naval vessels and servicemen and Russia’s continued, unjustified refusal to do so, Ukraine notified Russia that it was commencing mandatory arbitration under UNCLOS. Ukraine also has requested that ITLOS order immediate provisional relief to Ukraine by releasing its naval ships and 24 servicemen, in light of the urgency of the situation. 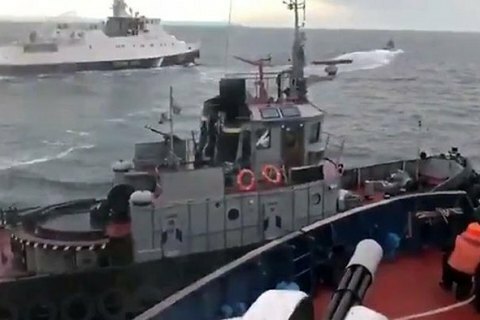 Since their capture on 25 November 2018, Russia has continued to detain Ukraine’s naval vessels and its servicemen. The servicemen, who are being held in Russian prisons pending trial for alleged criminal violations of Russia’s border control laws, have been subjected to interrogation and involuntary psychological evaluations. If ultimately convicted, they may be sentenced to up to six years in Russian labor camps. "Every additional day of detention harms the Ukrainian servicemen and constitutes a further affront to Ukraine’s legal rights under UNCLOS and customary international law. Today’s request for provisional relief seeks to protect against the serious and irreparable harm that will be caused by the continued detention of Ukraine’s naval vessels and the continued detention and prosecution of its servicemen," the Ukrainian Foreign Ministry said. The next step in the proceedings will be a hearing before ITLOS on Ukraine’s request. Ukraine expects such a hearing to be scheduled within the next several weeks, and that a decision will issue soon thereafter.